You are triangle. Shoot squares. Get points. 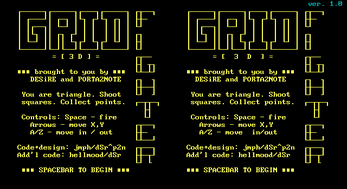 Gridfighter 3D is a classic '80s-style arcade shooter for your Forte VFX1, Oculus Rift DK1, or other VR headset that does side-by-side rendering. 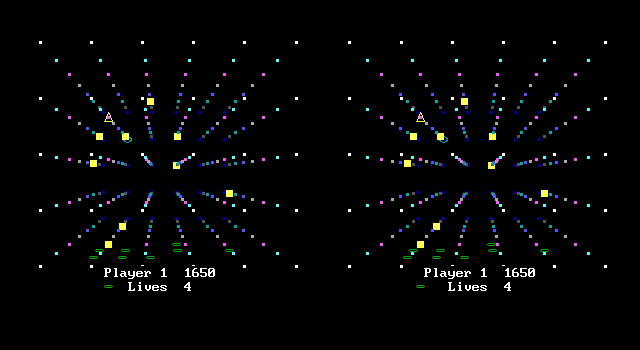 Gameplay is reminiscent of Tempest, Galaga, or even Arkanoid with the added challenge of the third dimension. 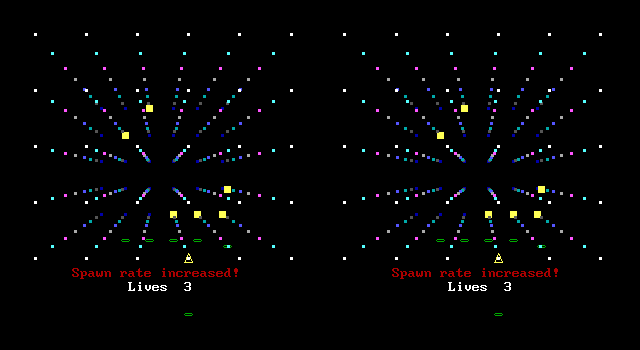 Enemies will aggressively follow you around the map in 3D and you must get in front or behind them to blast them - and you're gonna want to hit as many as you can with the same shot for big multipliers. 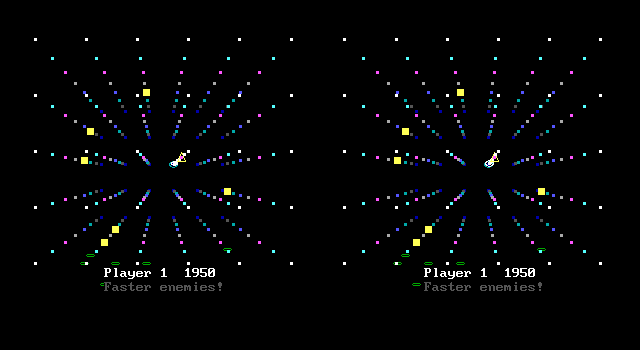 Features surreal 4-bit neon colors, a full 3D playfield & properly-arcade square-wave music & sound effects. 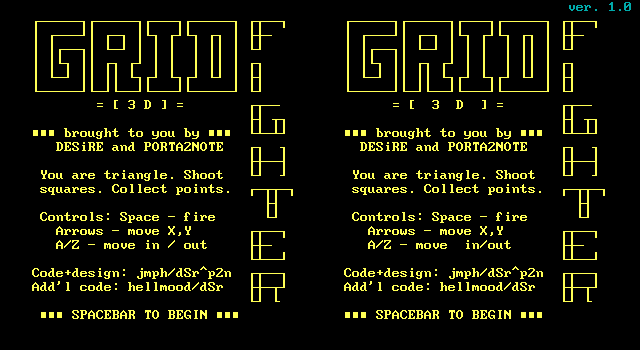 Gridfighter 3D is the first complete DOS game to support the Oculus Rift that we're aware of. It's also almost certainly the first one to support both the Rift AND the Forte VFX1. More headsets will be added when we get our hands on them for testing & geometry setup. 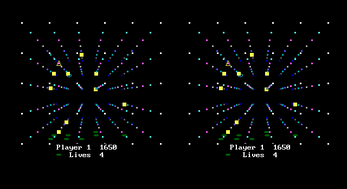 This game runs in a DOS environment and supports all the various compatible DOSes such as FreeDOS, MS-DOS, PC-DOS, and DR-DOS. We also support all the versions of Windows anybody cares about - 95, 98, NT4 (x86 only), ME, 2000, and XP. If you're using a different OS than those, or on a non-x86 platform (e.g. 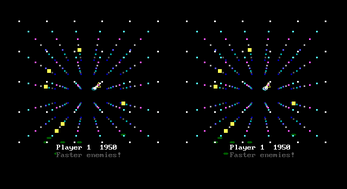 ARM), use an emulator such as DOSBox. 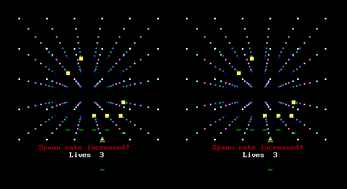 Native Linux binaries are provided in 32- and 64-bit form. These should work on most relatively recent popular distros. The Mac OS/X port supports 64-bit machines running 10.6 (Snow Leopard) and up. The 1.44MB floppy image contains binaries for all platforms, and can be written to disk with dd or utilities such as DiskWrite, or mounted as a virtual disk. If you are not intending to use a floppy or virtual floppy, we recommend you download the main archive for your platform instead.